Discussion in 'iPad Accessories' started by milnicks, Dec 13, 2014. I recently purchased an iPad Air 2 and have been researching cases pretty meticulously. I decided to pick up the Logitech AnyAngle case to test; it is fairly new, so there is not much on the interwebs about it at the moment. I won't regurgitate the marketing information that is readily available online, but did want to post my impressions. The variable stand functionality really is excellent. You can choose your angle and it will hold sturdily, be it on a hard surface or on your lap. The cover's magnets are awesome. Sleep/wake works great, there is no front-flop whatsoever when held upside down, and (best and rarest of all) when you flip the cover around IT ACTUALLY STICKS TO THE BACK. This is a feature that I really can't seem to find elsewhere. Protection level seems quite high. There is a significant side-bumper and the cover is extremely durable and seems like it could take some abuse. The clear back is very tasteful, and the little ridge for the bumper material makes for a natural feel while carrying the iPad around. WEIGHT. This thing is heavy. It weighs in at 342 grams, more than twice the weight of the Apple Smart Case (144 grams). The iPad Air 2 (WiFi only version) weighs 437 grams, so using your iPad inside of this case feels similar to holding two Airs stacked on top of each other. The total package is also 99 grams heavier than the original iPad. A fair amount of the weight is attributed to the cover, and I assume is added mostly by the magnetic hinge. The edges of the case are at a fairly steep angle, which has two undesirable results. First, the angle produces sides that are uncomfortably sharp. This is further emphasized by the seam in the plastic molding, which is placed right on the edge. Perhaps if this case was lighter it would be less of an issue, but as you hold your iPad in this case it will start to dig into your palms/fingers/whatever is touching the edge. The second consequence of the edge design is that the button covers are set at a very strange angle. Pressing them is a bit more natural (if a bit difficult) when the cover is on the front or in stand-mode; however, when you have it flipped around the back like a magazine, the cover obscures the angled buttons and makes them essentially impossible to press. While I love the look and materials of the case, and truly enjoy functionality of the cover (in stand mode and especially the magnetic performance of sticking to the front and back), I am afraid that the weight of the case is just too much of a compromise. The sharp edges don't help either. I really wish someone made a lighter version of this without the goofy angular edges, because I would throw money at them. For now, I think I will be going with the smart case and will just have to deal with the annoyance of the cover flopping around when I have it flipped to the back. Hopefully this helps someone make a decision! For now, I think I will be going with the smart case and will just have to deal with the annoyance of the cover flopping around when I have it flipped to the back. Thanks for the review. For what it's worth, my wife has the Smart Case and the cover does stick to the back. The magnet is not very strong, so it won't stand up to shaking it, but it does stick. Nice review. I've been needing a case for my Air 2, as the cheap-o folio I got to hold me over until a Lifeproof Nuud comes out was driving me crazy. Best Buy has this on sale for $10 off, $49.99 today. I had some RZ certifications to burn, so I figured for my $35 net cost, I would give this case a shot. I read over your "cons" very carefully. This looks to be one of the only Air 2 covers that does not obstruct the dual ambient light sensors, which are near the very top outer edges of the Air 2, even higher up in the bezel than the camera. So, if the case must attach to the iPad and not cover those sensors it must physically extend out further in all dimensions. In order to save weight (one of your other main cons), it must taper at a severe angle, or there would be even more bulk/weight. I guess I'll actually have to use it to see if it is bothersome. But I think there is no real way around this design, without covering up the ambient light sensors, while still providing useful corner protection from drops. 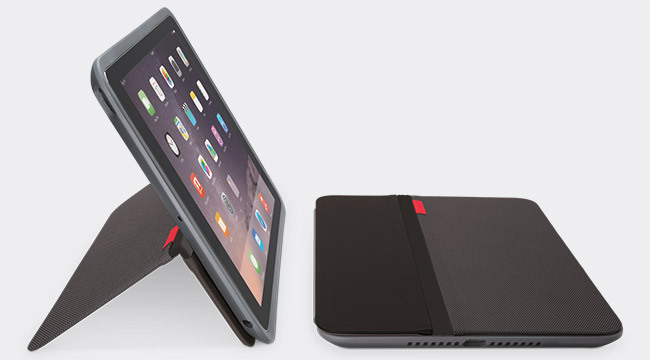 The selection of 3rd party cases for the iPad Air 2 are just downright terrible. Looks like I'll just have to eat the $80 and get the smart case. I was feeling the same. But I am starting to think the Smart Case is not going to protect against a cracked screen, if you drop the iPad. For what it's worth, my wife has the Smart Case and the cover does stick to the back. The magnet is not very strong, so it won't stand up to shaking it, but it does stick. Thanks for sharing, hopefully the magnet will be strong enough to prevent flopping when holding on the left side. I think there is no real way around this design, without covering up the ambient light sensors, while still providing useful corner protection from drops. That is an interesting consideration. Hopefully these case engineers figure something out eventually! I am starting to think the Smart Case is not going to protect against a cracked screen, if you drop the iPad. It is far from scientific, but this drop test video might make you feel a little more confident. Ha! I still don't trust the smart case vs. my kitchen tile. Already busted an iPad 2 that way a few years back. Thumbs up for the review. Great info. I was seriously looking at this case, but it looked too thick, and as a result too heavy. Glad to hear you confirmed it. That's unfortunate that a case doubles the weight of an iPad. The articulating stand does a great job supporting the iPad. This is definitely the best feature. Case surrounds the iPad screen yet still leaves room for the ambient light sensors of the Air 2. I do not know of another rugged case that allows for this. The back is nice and has a similar design to the Lifeproof Nuud for the original Air. Cutouts for all ports seem good. The bottom edge of the case (along the iPad's side where the home button/Lightning dock/speakers are) does not fit well or tight to the iPad. This is because that side is less-stiff than the other three, due to the multiple holes for the speaker cutouts, etc. Kind of frustrating. Sleep/wake button OK, volume buttons don't give good tactile feedback, especially compared to what's offered on the Lifeproof Nuud. The molding/seam around the edge is really annoying and sharp. I think I might take some sandpaper to it? You really can't see this in any photos, and it is hard to describe. Overall, I can probably live with all the cons, except maybe that loose bottom edge. When you're holding the case next to the Home button, it just flexes too much, and separates where you can actually see the metal edge of the iPad. I will likely keep it for a few months, at least until Lifeproof comes out with a Nuud for the Air 2, and prices/sale on those gets into the $70 range. The full MSRP on a Lifeproof is just a bit steep for me. Too bad you can't combine the cover of the Logitech, with the case of the Lifeproof. That would be the ideal rugged case! I returned my AnyAngle this week and picked up the Smart Case. Immediately I miss the versatility of the Logitech's stand, which is probably unmatched. Though I will say I think the hinge was already starting to get a little "loose" after a week or so of use. The lighter weight of the Apple case makes a huge difference in handheld use. Unfortunately the cover flops around a bit too much for me, as expected. I have a Moshi Versacover on the way and am hoping it fits my needs a bit better. I've had my AnyAngle about a week. 1). Yes, it's heavy. I usually use just a skin and sleeve but wanted something better with a stand for travel. I'm getting use to the weight. 2). I really dislike the folding options of the Apple case and/or Smart Cover. I bought the Smart Cover when it originally came out and just never liked it at all. 3). I like the AnyAngle stand and find that it works quite well, even when just setting it in my lap. 4). One thing I did not think about...I wanted the Teal color but it was a pre-order so I went with the violet. I like the color but I always buy ipads with the black bezels. Don't like the white bezel. The violet case has a whiteish bezel and I find it a bit distracting. I'm not returning it but if I were ordering again I probably would get the black. And I'm betting that if I had a white bezel on my iPad the whiteish of the violet case would look even worse. 5). I have a dry skin from best skins ever on mine because I only wanted the case for travel. It fit with the skin on but it's really tight. I have decided to leave the case on. I'm thinking that the skin might get pulled off if I remove the case. Not a huge issue for most folks. 6). Using the volume buttons is a bit hard. I have to press pretty hard to get them to work. But since I don't use them often (I use the control center) it's not an issue for me. All in all I like the case. The weight is not as much of an issue as I thought it might be. The cover works very well, doesn't flap open, sleep/wake works every time and it sticks to the back if I need it too. The cutouts are perfect. Covers the chamfer edges and is actually pretty rugged. I'm impressed with the manufacturing. I most certainly would buy this case again. As for recommending it to others...I would caution about the weight. Some will find it off-putting. Some, like me, won't. Otherwise, the best case I've run across in 4 years. AnyAngle looks something like im looking for, but... Is it that a rubber around corners?? What material is the back part? Yes, it is rubber around the corners. Back is clear plastic. I ended up returning mine to Best Buy. I did not like the seam around the edge, and the weight was getting rather bothersome. I ended up getting the STM Dux for Air 2. Amazon had them for $45 (for a short while), so close in price to the AnyAngle. The Dux is pretty good. It only has one "angle" but that hasn't really presented itself as a problem. The front cover secures around nicely via magnet, and it feels good closed up in your hand, unlike the AnyAngle. The AnyAngle felt like a book that was about to open, where the Dux feels shut tight. The main flaw of the Dux is the looseness of the case around the speakers, TouchID area. It is worse than the AnyAngle. However, I'm starting to realize that unless you have a very rigid case (upcoming Lifeproof Nuud?) this is going to happen. The only other niggle is that the sleep/wake button takes some getting used to, requiring a certain angle press to get consistent activation. "studio for iPad Air 2" -case looks interesting and quite similar than samsung case for note tablets which is excellent. I got the Logitech AnyAngle and the TwelveSouth SurfacePad for iPad. The Logitech AnyAngle is a pretty sweet case, but the weight really ruins it. Compared to the SurfacePad, its night and day. I think I'm going to return the Logitech as well. Makes it so much heavier -- but after using for a few days, the arbitrary angle settings make it so useful I can look past it. I never liked the traditional Smart Cover. The folding cover I always fiddled with and still didn't give me quite the right angle. I recommend the Moshi Versacover. Have one on our iPad mini - and immediately got one for my iPad Air when I bought it. I picked this case because of its non poly carbonate back, less likely to break. My previous case broke because I had to swap sims often.